Yamaha Outboards Win J.D. Power Award No. 1 in Customer Satisfaction in both 2- and 4-stroke categories - News Releases | Yamaha Motor Co., Ltd.
On Sept. 4, 2002, the international market research organization J.D. 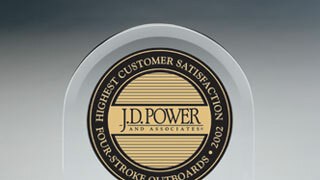 Power & Associates (Headquarters: Westlake Village, Calif., USA), which specializes in surveys of customer satisfaction (CS), released the results of its 2002 Marine Engine Competitive Information Study SM. The survey revealed that Yamaha outboards ranked highest in customer satisfaction in both the 2-stroke and 4-stroke categories. The survey was based on questionnaires completed by roughly 12,000 leisure-use boat owners who purchased new boats in 2001. The owners were asked about eight aspects of their engines, including the ease of starting when the engine is cold and hot, the ability of the boat to accelerate quickly, the quietness of the engine at cruising speed, fuel economy and warranty coverage. The answers were then translated into point equivalents for comparison between makers. J.D. Power & Associates is renown for the reliability and integrity of its customer satisfaction survey results, and its automotive industry rankings are so highly regarded that they always receive prominent coverage in the press. The recently released survey shows that customers in the worlds largest pleasure-use boat market rate Yamahas the best outboards on the market. For detail about the survey results please refer to the materials released by J.D. Power & Associates. In the 2-stroke outboard category Yamaha scored 851 points out of 1,000 (industry average: 784). Yamaha received especially high points in the areas of reliability, ease of starting, acceleration performance and warranty coverage. 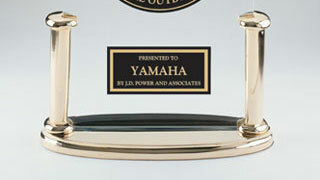 In the 4-stroke outboard category Yamaha scored 877 points out of 1,000 (industry average: 841). Yamaha received high ratings in all categories with especially high points in the areas of acceleration performance and cruising speed. Phil Dyskow right, the President of Yamaha Marine Group Company, U.S.A., receives the J. D. Power Award from Director of Marine Practice, Eric Sorensen of J. D. Power and Associates at the Boatbuilding 2002 conference show meeting in Atlanta, Georgia, on Sept. 25. J.D. Power & Associates (established 1968) is a renowned marketing survey company that specializes in customer satisfaction and product quality surveys and consulting. The company conducts detailed surveys of its own design covering a wide range of products and services that provide unbiased analysis of customer opinions and evaluations which are then supplied to the related industry. Some of their survey reports and industry rankings are released in the form of press releases. The surveys conducted by J.D. Power & Associates are characterized by the fact that they are based on the analysis of questionnaire responses of large numbers of actual consumers reached by mail, telephone and e-mail, rather than the opinions of a limited number of experts. The company conducts surveys in a wide range of industries, including the automotive, financial, travel, communications and IT industries, and it is especially famous for its surveys of customer satisfaction concerning different automobile classes. The company also publishes the results of numerous surveys in the marine industry. Besides the USA, J.D. Power & Associates has offices in the U.K., Canada, Australia and Singapore.